Cash Fares: Children under sixteen years of age are charged fares at such special child rates as may be specified from time to time. One child under five years of age will be carried free if accompanied by, and in the charge of, a fare-paying passenger. Where doubt exists as to the eligibility of a child for a reduced fare, it is the responsibility of the passenger claiming the child fare to produce evidence of age. Leap Fares: Children under sixteen years of age, who are in possession of a non-personalised Child Leap Card 5 -15 Years and children under nineteen years of age, who are in possession of a Personalised Child Leap Card 16 – 18 Years, may avail of Leap child fares where available on designated Leap-enabled services. A special schoolchild fare is available on Provincial City Services only, in Cork, Limerick, Galway and Waterford. This schoolchild single fare applies during normal school terms for travel between home and school Monday to Friday up to 19:00 hours and on Saturday up to 13:30 hours. Cash Fare: Schoolchildren under sixteen years of age may avail of the cash Schoolchild single fare on city services during the specified school term hours. Leap Fare: Children under sixteen years of age, who are in possession of a non-personalised Child Leap Card 5 -15 Years and children under nineteen years of age, who are in possession of a Personalised Child Leap Card 16 – 18 Years, may avail of the Schoolchild Leap single fare on city services during the specified school term hours. Non-Expressway services where the intended journey of the child passenger exceeds 50 kilometres. Where doubt exists as to the eligibility of a child for unaccompanied travel, it is the responsibility of the passenger claiming such eligibility to produce evidence of age. Single Tickets are valid for one single journey on date of issue as shown by fare paid and/or other details on the ticket. Return Tickets are valid for one outward and one inward journey only. They are not valid for two journeys in the same direction. Ordinary Return Tickets (monthly validity) are valid for one outward journey on date of issue as shown by fare paid and/or other details on the ticket, and for return journey for up to one month from date of outward travel. Day Return Tickets are valid for one outward journey on date of issue as shown by fare paid and/or other details on the ticket, and for return journey on the same day. Day Return Tickets are valid for one outward journey only on date of issue as shown by fare paid and/or other details on the ticket, and for return journey on the same day. Passengers who wish to return on another day will not be issued with an excess fare ticket. USI Plus Card as issued by Campus.ie or at Student Union Offices nationally. A full list of colleges are available whose Student Identity Cards will be recognised by Bus Éireann for entitlement to student fares. Cash Fares: Student Single, Return and 10-Journey Tickets are issued at discounted fares to students aged sixteen and above on production of a valid International Student/Scholar Identity Card (ISIC); or a current Student Identity Card issued by a recognised third-level college in the Republic of Ireland; or a current Translink yLink Student Identity Card; or a current Student Travelcard/Student Travelcard for Teens as issued by Student Travelcard Ltd., or a valid Bus Éireann Student ID card for second level students 16+; but otherwise have the same conditions of validity as ordinary Single and Return tickets. Leap Fares: Leap Single, 24 Hour Rolling and 7 Day Rolling products are issued at discounted student Leap fares, where available on Leap-enabled services, to students aged nineteen years and above who are in possession of a valid Leap Student Travelcard. Students aged under nineteen years, who are in possession of a Personalised Child Leap card 16-18 Years, may avail of discounted Child Leap fares. Weekly (10 Journey) Tickets are valid for 10 journeys as specified and as shown by fare paid and/or other details on the ticket for a period of seven consecutive days inclusive of date of issue and including Sundays. For example, a Weekly Ticket issued on Tuesday is valid up to and including the following Monday. When a public holiday falls within the period of validity of a 10-journey ticket, the expiry date is automatically extended by one day without endorsement of ticket. Child 10 Journey Weekly Tickets are issued to children under 16 years of age on production of valid Bus Éireann Record Card showing child's date of birth. Student 10 Journey Weekly Tickets are issued to students aged 16 years and over on production of valid Bus Éireann Record Card or current International Student Identity Card (ISIC) or valid Student Identity Card issued by a recognised third-level College in the Republic of Ireland. A full list of colleges are available whose Student Identity Cards will be recognised by Bus Éireann for entitlement to student fares. 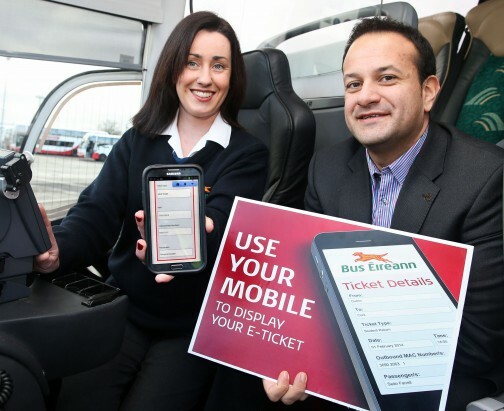 Apprentices over 16 and under 23 years of age may be issued with Student 10 Journey Weekly Tickets on production of valid Bus Éireann Record Card. Bus Éireann Record Cards are issued at Bus Éireann Area Offices and Travel Centres on completion of Record Card Application Form, which must be stamped by the school/college/employer and supported by sight of Applicant's Birth Certificate. In all cases where concession rate tickets are issued on production of the appropriate card or document showing entitlement to the concession, such card or document must be produced for inspection on each occasion on which the ticket is tendered for travel. Where Record Cards, or other concession entitlement documents are used after the due expiry date, or are transferred to another person, or are fraudulently used in any other manner, they will be confiscated. In such cases, the appropriate full fare must be paid for the journey undertaken. Please try to have the exact fare ready for the driver when boarding the bus; it will help us to speed up the journey for you and for other customers. If you have a pre-paid ticket or pass, please have it ready for the driver to inspect on boarding and to validate as necessary. Please also retain your ticket throughout the journey and produce it for inspection when requested. Should you require other fares information please contact our Travel Centres or e-mail us. Discounted student fares are available to students over 16 years of age who hold current ISIC (International Student Identity Card) or valid Student Identity Card issued by a recognised third-level College in the Republic of Ireland. A full list of colleges whose Student Identity Cards will be recognised by Bus Éireann for entitlement to student fares is available online. Students attending UCD (Belfield) and DCU should enquire at their Students’ Union office about direct daily commuter services. Our weekly commuter tickets are very good value. Everyone aged 66 and over, living permanently in Ireland, is entitled to free travel under the Department of Social Protection Free Travel scheme. Other qualifying persons under 66 years are also entitled to avail of free travel. In some cases, a Companion Pass is issued permitting a person aged 16 or over to accompany the Free Travel Pass holder free of charge. The holder of a Free Travel Pass must carry it at all times when using public transport. A Free Travel Pass is non-transferable and can only be used by the named person. For organised group travel on any service. The holder of a Free Travel Pass who fails to produce a valid pass when travelling will be liable for the appropriate fare and claims for refunds in such circumstances will not be entertained. Misuse of Free Travel Pass may lead to the Pass being confiscated and the holder liable for payment of the fare. For information on Free Travel Entitlements under the Free Schemes administered by the Department of Social Protection, please consult Social Welfare Leaflet SW40, contact your local Social Welfare Office or ‘phone 1890 500 000. Application forms for Free Travel may be obtained at local Post Offices.